Langar Rifle Club (LRC) is a friendly Home Office approved community amateur sports club founded in 1999. Situated on the edge of Langar village in Nottinghamshire our own 25 yard indoor range provides a comfortable and above all safe environment for small bore target rifle, sports rifle and air rifle/pistol shooting. 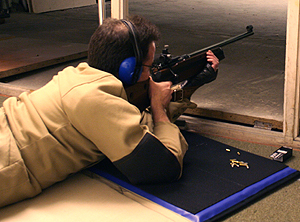 Our core activity at the range is prone (lying on the ground) target shooting using .22 calibre rimfire rifles. Many of our members however also take part in other shooting disciplines, mainly using fullbore, 7.62mm calibre, target rifles at distances from 300 yards to 1100 yards. We are proud to count amongst our members those who have represented Nottinghamshire and also England and Great Britain in international competitions. Target shooting is a sport which primarily involves a competitor, a single shot rifle and paper target. Stringent rules ensure it is one of the safest sports in the world. Targets can be shot both indoor and outdoor at various distances from 10 yards to 1100 yards It is a precision sport which involves careful body and eye co-ordination. Outdoor shooting requires an ability to read and respond to the natural conditions around you, wind speed/direction, topography of the range and even air pressure. LRC actively encourages people to consider target shooting as a hobby and welcomes enquiries from those interested in participating in such a fantastic and rewarding sport. Please refer to our Membership page for further information.